HAVING ADVISED an independent candidate, Angus King, who won the governorship of Maine a few years ago, I am automatically one of the nation’s leading experts on independent candidacies. To size up independent Tim Cahill’s chances, I spoke with King and, with the clarity of hindsight, we drew up lessons for success . . . Choose your opponents carefully . . . Be credible. . . . Be an outsider . . . Go all in. . . . Avoid scandal . . . Tread on familiar ground. . . . Show gains in polls. . . . Pick your spot. Definitely a must read for independent and third party strategists, not to mention candidates for office. Two Georgia Libertarians qualified for the impending special elections for Senate District 42 in Decatur and Senate District 49 in Gainesville today marking the first time in the Georgia LP's history that it placed two candidates for State Senate on the ballot at the same time. Libertarian David Montané will square off against the well funded grandson of Ex President Jimmy Carter, Jason Carter in the 42nd Senate district and Libertarian Brandon Givens will face down a horde of republican wanna bees in the 49th Senate District in Gainesville. This will make three special elections for the Georgia State Senate that have happened so far in 2010 and all three have had Libertarian Candidates running in the races. The Constitution Party announced today it is endorsing GOOOH, (acronym for Get Out Of Our House, pronounced “go”), the non-partisan plan to send independent citizen candidates to the U.S. House of Representatives. Founder Tim Cox was enthusiastically received at the biennial convention of the Constitution Party of Pennsylvania on Saturday, March 27, in Carlisle, PA, where he outlined the plan for the delegates. The Green Party (Grune) has become the third most popular political force in Germany, according to a poll by Infratest-Dimap. 14 per cent of respondents would vote for the Greens in the next election to the Federal Diet, up two points since January. The ruling Christian-Democratic Union (CDU) and its associate Bavarian Christian-Social Party (CSU) are still in first place with 35 per cent, followed by the Social Democratic Party (SPD) with 27 per cent. The Left Party (Linke) is in fourth place with 10 per cent, followed by the Free Democratic Party (FDP) with nine per cent. The California Green Party's 2010 candidate for governor spoke with the KPFA Morning Show's Brian Edwards-Tiekert on March 15, 2010. Neither Christine Todd Whitman nor Steve Poisner, the California Republican Party candidates in the 2010 governor's race, have yet responded to KPFA's request for interviews, and Democratic candidate Jerry Brown, a former KPFA host himself, has said that he will not appear on the station. We might expect the major parties to oppose a referendum that gives more power to the people and less to the party bosses. The main opponents of Prop 14 are the Dems and Repubs, however the minor parties have jumped on board, and now Independent Political Report, the prominent Libertarian blog, has decided to take a side (against). As many know, I personally (The Hankster) support Prop 14 and consider it a fair proposition that will give California independents (decline to state) the right to vote and provide an open field for all candidates in the first round of voting. Read independent attorney Harry Kresky's HuffPo response to Nader "Why Independents are Right and Ralph Nader is Wrong about Proposition 14." Reclaiming Our State Government (By Roger Clark, Fox & Hounds Daily) Californians are angry because we recognize the winds of partisan self-interest have eroded Citizen Power. Not since the days of Governor Hiram Johnson, who in 1911 successfully championed Citizen Power through enactment of referendum, recall and initiative to overcome the power of the special-interests of the day -- the railroads - have the people been as angry. Our frustration with partisan politics is evident as the ranks of "Decline-to-State" registered voters have swelled to almost twenty-one percent of all voters. RIP part-time Legislature. And danger looms (posted by Mark Landsbaum, Orange County Register/Orange Punch/Freedomblogging - a Libertarian blog) Meanwhile, there’s another initiative the full-time legislators themselves approved for the ballot: Proposition 14. It would provide open primaries. The argument for it is that it will remove the gridlock that comes from polarized ideologues in Sacramento. And that means, the Legislature will find more votes in the mushy middle to do things like expand government even more and impose even more taxes. Catching up on California Referenda, etc. (William P. Meyers, California Democracy blog) In particular I think that "third" parties will be able to attract more voters in the primaries under Proposition 14, and that should help them build their cores of regular voters. Netflix CEO Puts Cash Down "Open Primary" Rathole (Steve Rankin, Free Citizen blog) I am continually amazed that some independents and small party members support the “top two open primary.” I guess they don’t give a damn about having a chance to elect independents and small party candidates to office, since the final choice in the “top two” is almost always one Democrat and one Republican, two Democrats, OR two Republicans. PA: Libertarian Explains Rejection of "Both Old Parties"
According to The Morning Call's March 21 article on independent voters, one in nine Pennsylvanians are registered with neither the Republican or Democratic parties. The numbers are growing elsewhere. I am one of those elsewhere voters. I left the old parties to join the Libertarian Party. Why did I leave? After decades of the Republican/Democratic Party incumbent in power, I finally asked myself, ''How's this working out?'' Despite their rhetoric, both old parties have expanded the size and scope of government . . .
COLUMBUS, Ohio - All voters who switch parties for the May 4 primary must sign a form supporting their new party's principles under a controversial directive Secretary of State Jennifer Brunner issued on Friday. Boards of Elections around the state had varied in their approach to so-called "crossover" voters. Cuyahoga County, for example, required only voters switching parties at the polls to fill out allegiance forms during the 2008 primary. Franklin County, which includes Columbus, didn't force any voters to sign the forms in 2008 . . . Brunner's directive does not affect voters requesting the ballot of a minor party, such as the Libertarian Party or the Green Party, for the first time. Time Magazine has published a story on the top ten alternative political movements, which includes the Tea Party, the Modern Whig Party, the Pirate Party and the US Marijuana Party. Cutler said the system is undermining itself because many community college credits are non-transferable within the University of Maine System. He said functions and programs in the two systems are being duplicated — a serious problem for a fiscally challenged state. “We need to merge the systems. They ought to be under the same governing board; they should be under the same executive. They should be much more closely coordinated with [the] K-12 education system in Maine,” Cutler said. MILL VALLEY, CA--(Marketwire - March 29, 2010) - Christina Tobin, Libertarian Party candidate for Secretary of State of California, today announced four plans to save Californians' tax dollars and reduce government waste. "California faces a crushing $20 billion deficit. It is imperative that every state and local government agency find ways to save taxpayer dollars in the programs it administers," stated Tobin. Tobin's four methods for saving taxpayer dollars include: . . . Support all-mail voting . . . Allow small, qualified parties to nominate by convention, if they wish. . . . Abolish the tiny petitions for candidates seeking a place on the primary ballots for partisan office . . . Rather than requiring independent candidates obtain 173,000-plus signatures to get on the ballot, let them on the November ballot by paying a filing fee. After several months and a comprehensive search that attracted more than 200 candidates, the Trustees of the Geraldine R. Dodge Foundation have announced that Christopher J. Daggett will succeed David Grant as the new President and CEO . . . If you live in New Jersey, you probably recognize Chris’s name as the independent candidate for governor in 2009. He was the first independent candidate to raise the threshold amount of money to qualify for public matching funds and to participate in public debates with the major party candidates. He was also endorsed by The Star-Ledger, the state’s leading newspaper. Independents represent, among other things, the grassroots distrust of the two-party system in U.S. electoral politics. As discontent with both Republicans and Democrats sweeps through the country, some suggest that we need a third political party, but the truth is that we need two or even more third parties to adequately represent the spectrum of American opinion. The Green Party grew out of a dynamic green movement, coalescing as a body that was ready to run candidates for office in the early 1990s. Two major events this week strikingly illustrate how the leadership of the Democratic Party makes a pretense of defending the interests of working people – while actually attacking those interests on behalf of their corporate paymasters, including Wall Street. The first is the signing of the so-called Health Insurance reform bill in Washington – which should properly be named the "Health Insurance Company Enrichment Act of 2010." The second is the ramming through of Senate Bill SB 1946 in Springfield, which created a two-tier public pension system in most of our state’s public pensions. This was done in one day – between the time the text of the bill was amended and its passage in both houses of the General Assembly. Green Party member and University of Minnesota alumnus Dan Craigie announced his bid in the state representative race for District 59B on Friday evening at the Oak Street Theatre. Craigie, who graduated from the University in the fall of 2009 with a master’s degree in public policy, will be running against longtime DFL Rep. Phyllis Kahn as well as Republican candidate and fellow University graduate Ole Hovde. Why is Ralph Nader Opposing California Open Primary Proposition 14? What was Ralph Nader thinking? The sometime Green/ sometime independent Presidential candidate who garners less than a percentage point of the vote in 2000, 2004 and 2008 now wants to Stop the Top Two, the popular open primary initiative that will be on the ballot in California June 8.... Thanks to IPR for the heads up about Ralph. The burgeoning independent voting bloc is shaping up as the key battleground for the 2010 elections as the two major political parties watch their numbers erode statewide and locally. Arizona’s Republican Party lost 5,896 voters between Jan. 1 and March 1, according to figures released Wednesday by Secretary of State Ken Bennett. The Democrats lost 9,637 voters in the same period. That left the GOP with 1,121,753 voters, and the Democrats with 1,024,758. The only growing group of voters are those registered as Independent, unaffiliated or members of an unrecognized political party. That category increased to 939,542, up 10,323 registered voters in the state. NV: Tea Party Libertarians See Palin as "Part of Establishment"
The motley mix of Republicans, libertarians, gadflies and disgruntled grandparents gathered Saturday in Searchlight for the Tea Party Express rally could fit a loose definition of conservative. Beyond that, applying just a single adjective is a stretch . . . Others see Palin as a tool for Republican politicians to win the support of the libertarian-leaning Tea Party movement . . . "It is disappointing but not surprising," said Liz Kerby, former chairwoman of the Nye County Libertarian Party, of Palin's support for McCain. "She's not rogue, she sounds like part of that establishment," said Kerby, referring to Palin's book, "Going Rogue." I learned a lot about this great Libertarian candidate in my reasearch of him and after hearing his answers found that while we do disagree on a few issues, we also have many common beliefs . . .
What made you join your party rather than one of the two major parties or another 3rd party? I have always been a seeker after truth and I found the politics of the two major parties to be confusing and disingenuous. I am also headstrong and don’t like being coerced to do anything or give away something I have earned. I migrated politically over many years to the Libertarian Party, even while reserving the right to disagree with them. Eventually I realized I had found my political home. and get Illinoisans to the polls? The problem isn’t the distrust, which I feel we should never lose. The problem is the politicians. When the primary goal is getting re-elected, truth and honesty go out the window. For this reason, I support term limits, like those in the Putback Amendment. Freed from the need to pander for votes, the politician can focus on standing on his/her principles. Think of holding office as you would jury duty. You go do your duty with honor and dignity and then go back to your plow, wrench or pen. A Nevada asphalt contractor who faces a legal challenge to his Tea Party of Nevada candidacy for U.S. Senate was hit Friday with felony theft and bad check charges in Las Vegas that allege he bounced a $5,000 business check last year. Scott Ashjian is one of a record 22 candidates, including 12 Republicans, running for the seat held by Senate Majority Leader Harry Reid, who is seeking a fifth term. While fractious, the Tea Party movement is united by the overwhelming sense that government has overstepped its bounds . . . Kathleen Kendra, 60, a chiropractor from Riverside, said the administration and Congress are “railroading our citizens into socialism.” Disgusted with both major political parties, Kendra joined with friends to revive the Whig Party in Riverside. The group elected officers in January and is fielding candidates in local races. Green Party Calls for "Medicare for All"
Green candidates and party leaders said today that the passage of the Democratic health care bill, with its increased financial burdens on millions of Americans, should not slow the movement for Medicare For All (single-payer national health care) . . .
Green Party Watch has more details. Mainstream parties were routed in an astonishing council by-election result just days before Prime Minister Gordon Brown is expected to call a general election. The Greens' Rachel Eburne captured a Tory seat at Mid Suffolk District, also humiliating the Liberal Democrats and Labour. She polled 61 per cent of the vote at Haughley and Wetherden with a 33.2 per cent net swing from the Conservatives. Labour, which had a councillor in the ward until 2003, polled just 32 votes. The Lib Dems, a close second last time, only managed 51. The result comes a week before another by-election challenge for the Green Party in a Lancaster City Council ward where they shared seats with Labour in 2007. Green leader Caroline Lucas is seeking a General Election breakthrough for her party. [Republican State Senator] Roy Ashburn is one reason I left the liberal, big-government-loving Republican Party and re-registered in the Libertarian Party. Republicans pretend to want small government but always vote to grow "Big Brother" spending programs. Ashburn voting to increase our taxes is the perfect example. Our guest for today’s Important Voices interview is David Nolan. David was one of the people who played an integral role in founding the United States Libertarian Party. He subsequently served the party in a number of roles including National Chair, editor of the party newsletter, chairman of the By-laws Committee, chairman of the Judicial Committee, and Chairman of the Platform Committee. David originated the famous “Nolan chart,” which attempts to improve on the simple left versus right political taxonomy by separating the issues of economic freedom and social freedom and presenting them in the format of a plane. Follow the link for the interview. Before the last election I, like many people, had no idea what modern Democratic Socialism really means, or what it could mean for the United States. So, in the interest of being a wise and fully informed voter, I took the time - cautiously, and with much skepticism, I might add - to visit the Socialist Party USA Web site to educate myself on this seemingly nefarious ideology that somehow crept into our president-elect's repertoire. Well, I was so impressed by the Socialist Party platform that I became I dues-paying member that very day. I would encourage local Democrats who are fed up with that party's status quo to do the same. You will be pleasantly surprised to find how easy and sensible that transition is. March 22, 2009- Co-chair of the Socialist Party USA, Billy Wharton, opposes the healthcare bill passed yesterday by the House of Representatives and scheduled to be signed into law by President Barack Obama on Tuesday. Wharton’s opposition is based on the belief that this bill is not a reform. Instead, it is a corporate restructuring of the health insurance industry created to protect the profit margins of private insurance companies. According to the new Public Policy Institute Poll, disgusted voters are ready for a third party in California. Fifty-five percent of likely voters think a third party is needed. This reflects a similar finding in September 2008. There is no warmth from likely voters for the two major parties. Twenty-five percent of the nation's electorate said they would "definitely" consider voting for "an independent candidate with moderate views on most issues" in the 2012 presidential race, and an additional 42 percent said they would "probably" consider doing so. Twenty-eight percent said they would "definitely" or "probably" not consider voting for an independent candidate. "This poll shows that a serious independent candidate would have a shot at 25 percent of the vote, maybe more," said Faucheux. "This is 6 points higher than the 19 percent independent Ross Perot received in 1992. Of course, it ultimately depends upon the qualifications and appeal of the actual, flesh-and-blood candidate and whether he or she has the resources to mount a full-fledged nationwide campaign." At the March 2010 General Assembly of Delegates, the Green Party of California easily reached consensus on opposing Proposition 14. If adopted, all candidates for partisan office would be required to run in a single, combined Primary Election rather than each party having it's own Primary. Voters may vote for any party's candidate, but only the two highest voted candidates would proceed to the General Election. No longer would each party be represented in the General. In fact, the two candidates in the General could be from the same party. Obviously, this measure would make it extremely difficulty for minor parties to get their candidates - especially for statewide offices - seen by the voters in the General Election. There was a previous ballot measure proposing this "top-two" concept, which the GPCA also opposed. The present measure made it on to the ballot by being a part of the "deal" to get State Senator Abel Maldonado to vote in support of the February 2009 budget package. Defeating Proposition 14 is a high priority for the GPCA. Because we, and other small political parties, constitute just a minority of the total voters, we must reach out beyond our GPCA membership to defeat this measure. Since the launch of Third Party and Independent Daily on January 1st and the creation of its individual news pages sections over the last few months, I have continued to experiment a bit with the resulting functionality, and am pleased to announce the creation of Third Party and Independent Daily Headlines! The site brings together feeds from TP&ID's news pages with those from Poli-Tea as well as other sites in the third party and independent blogosphere, providing what might be the most comprehensive overview of today's third party and independent political news on the web. Give it a look and let me know what you think if you're so inclined. Also, if you are interested in becoming a contributor to TPID, don't hesitate to send an email. Whatever the cause, a record number of Montanans — 320 of them — have filed for election to Montana's Legislature. Whatever the reason, such a level of interest cannot be a bad thing.They'll be vying for 126 seats — 26 four-year terms in the Senate and all 100 two-year terms in the House . . . In the 2009 Legislature, the House was divided 50-50 and Republicans controlled the Senate by a narrow 27-23 margin. The founder of a growing national movement intent on replacing the entire U.S. House of Representatives will speak at Saturday’s Constitution Party Convention in Middlesex Township . . . Cox’s movement, known as Get Out of Our House, or GOOOH (pronounced “go”), claims to be gaining traction, with more than a million visitors to the www.GOOOH.com Web site, and Cox has been featured on numerous media programs. The Libertarian Party of Colorado has published a list of its candidates for this year's elections, including candidates for governor, US House and Senate, the state legislature and county government. The site notes: "Our vacancy committee is seeking more candidates. If you are a registered Libertarian in Colorado as of March 12, 2010 and are interested in running for office, please contact us." A lousy $26. That's how much money kept would-be Libertarian Party candidate Savva Vassiliev off the June primary ballot in the 27th Assembly District. Vassiliev, 24, a self-described actor-writer from Carmel, planned to use his candidacy to speak out for gay marriage, legal marijuana and lower taxes, among other issues. But Vassiliev fell short by $26 — $26.10 to be exact — of submitting the required combination of money and voter signatures to cover the $952.91 candidate filing fee to run for the state Legislature. Vassiliev believes that an election system that informed him of the shortfall days after the March 12 deadline and refused his offer to pay the $26 is unfair. The conservative Independent American Party’s U.S. Senate candidate sued today to remove a fellow U.S. Senate candidate running under the Tea Party of Nevada from the ballot. Tim Fasano, of Fernley, filed the lawsuit in Carson City District Court, arguing that Tea Party of Nevada candidate Jon Scott Ashjian should be removed from November’s ballot because he failed to change his party affiliation until after he filed for office. In my ongoing series of interviews with Conservative and Libertarian candidates for elected State and Federal office, I recently talked with Gino DiSimone—Gubernatorial Independent Candidate for Nevada. True pro-American patriot candidates deserve as much of our support as we can muster. Follow the link for the full interview. After a huge amount of work by our policy groups, policy group leaders, our manifesto co-ordinator, by the web team who built voting software, and most of all by the members of the party who put forward the proposals and voted democratically on every point, I am very proud to announce that our 2010 general election manifesto is now ready. The manifesto calls for copyright and patent reform, demands a strengthening of the right to privacy in all communications, and hence also for greater protections to the freedom of speech. The office of California Governor pays an annual salary of $173,987; however, the three top Republican and Democrat contenders, hoping to be the next governor of California will more than likely spend over $200 million for the governor’s seat. Republican billionaire Meg Whitman has stated that she will spend up to $150 million of her own money to be governor and Republican Steve Poizner wrote a $15 million check as down payment on the governor’s office. The un-contended Democrat, Attorney General Jerry Brown is hoping to challenge Meg Whitman and Steve Poizner with the backing of casinos, unions and third party committees . . . The fact of the matter is that an open primary system, under Proposition 14, will do little to change the current status quo. What it will do is increase the cost of campaigns – since candidates will have to correspond to all voters, not just those within their own party – thus, giving lobbyists more influence as well. If there was a perfect moment, for universal single-payer healthcare activists to move from talk to courageous screams for justice, it would be right now. Forget the political calculus…burning issues must always trump the politics of the elites . . . So who says we need to give up and accept a fundamentally flawed corporate-written health insurance bailout bill, rather than a clear and principled healthCARE reform bill? We already have the foundations for an equitable and cost effective system in Medicare…let’s improve on Medicare and make it available to everyone! Philip Shropshire has more on Bortz at the Examiner. Editorial: Pérez's next act must be better than his opener (Sac Bee) Pérez was in charge when the Legislature's attorneys engaged in a ham-handed attempt to help a union and the Democratic Party win a suit to water down the open primary initiative, Proposition 14 on the June ballot. The effort largely failed in the courts, but not for a lack of trying. Proposition 14 offers mythic solutions for California (San Diego Conservative Examiner, Robert Rische) The problem, however, is Independents already hold all the cards in elections.... Thus, it is hard to understand why this group of voters is continually viewed as being disenfranchised, simply because they choose not to identify themselves with any major party. ATLANTA (March 18, 2010) – A bill in the state legislature could compromise your privacy if you use certain prescribed or over-the-counter medicines, says the Libertarian Party of Georgia (LP Georgia) . . . SB 418, which was referred to last year as the Georgia Prescription Monitoring Program Act, would create a database to monitor certain prescription and over-the-counter drugs, such as Ritalin, Xanax, most pain medications, sleep aids and any product containing pseudoephedrine. the Tucson Hispanic Chamber of Commerce . . . has announced it will hold a three-day, nonpartisan, come-one come-all "Candidate Academy" next month . . . "You don't have to be Hispanic and you don't have to be a businessperson," said Lea Marquez-Peterson, the chamber's president and CEO. "We've heard so much about elected officials and candidates not being business-friendly, so we decided to take responsibility for educating them." . . .
Marquez-Peterson has already met with local Democratic and Republican party heads, and plans to meet with Green and Libertarian chiefs as well . . . As for speakers at the workshops, she said that's "still a work in progress, but it's going to be a balanced approach, politically. We'll include Demo-crats, Republicans, Green and Libertarian party representatives." The absence of a Green Independent Party candidate from the governor's race means 6 percent to 9 percent of the Maine electorate will be up for grabs in November . . . Since first appearing on Maine's gubernatorial ballot in 1994, Green candidates have always gotten between 6 percent and 9.5 percent of the vote . . . Cutler agreed it's possible Greens may turn to him. He cited his strong environmental record – as an aide for the late Sen. Ed Muskie, Cutler was involved in passing the Clean Air Act and Clean Water Act – and the fact he's running as a political outsider, like Williams . . . "A number of Greens may want to vote for him," said [Green candidate coordinator] Chipman. • DAVID CURTIS is running for Governor of Nevada . . .
• DENNIS S. SPISAK is the Green Party of Ohio candidate for governor in 2010 . . .
• S. DEACON ALEXANDER is one of two candidates competing for the California Green nomination for governor . . .
• RICH WHITNEY, a civil rights attorney based in Carbondale, is running again for Governor of Illinois. At a time when Illinois is experiencing devastating cuts to education and social services, Mr. Whitney is the only candidate in the race who refuses to accept such cuts as inevitable. On Wednesday, the county commissioners -- in their status as the county board of elections -- certified the Libertarians as one of the three official political parties in York County. That designation came down from the state level.Two other statewide organizations identify themselves as third parties: the liberal Green Party and the conservative Constitution Party.But the Libertarians are the only organization that meets Pennsylvania's legal definition of a third party. They earned that distinction last year. In order to get the minor party designation, a group has to put up at least one candidate running for a statewide office. And that candidate has to get at least 2 percent of the votes that the highest vote getter for a state office received, regardless of whether they're running for the same office. Technically, the Green and Constitution parties are classified as "political bodies." Being classified as a minor party instead of a political body has advantages. Candidates can't declare themselves members of the party without its approval. Whether born on the left or the right side of the political aisle, the government's huge initiatives of recent years have left perhaps more ordinary citizens than ever wondering what influence they have over the forces that shape their lives. Into this breach steps Michael Anthony Peroutka, a Pasadena attorney, former U.S. presidential candidate (he led the U.S. Constitution Party ticket in 2008, winning more than 150,000 votes) and co-founder of the Institute on the Constitution, an educational initiative that has offered seminar-style courses on the nation's founding documents since 2000. Les Green said he can do the math, and the two mainstream political parties have "sent this country into trillions of dollars of debt." Green, a DeSoto County math teacher and father of three, says he's making an independent run for Congress to ensure that future generations aren't saddled with debt. He launched his candidacy for U.S. Representative from the First Congressional District this past week. "Both parties promise they'll do better - as soon as they regain power," Green said. "But even then, nothing changes. They bicker while our nation stumbles. It's time to do something different. It's time for Independent leaders in Congress whose only interest is yours." On Monday, March 15th, the Green Independent Party of Maine turned in signatures to qualify 18 legislative candidates throughout the state, the second highest total in 12 years of holding official ballot status. For the first time in recent history, voters will have the option to request a third-party ballot for a partisan primary election as the result of a directive issued in December by Ohio Secretary of State Jennifer Brunner. 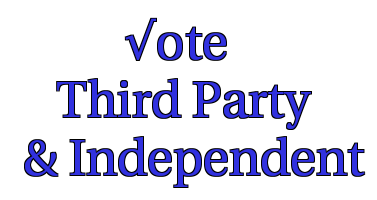 The recognized third parties in Ohio are the Constitution Party, the Green Party, the Libertarian Party and the Socialist Party USA. Each party’s certified candidates will appear on the ballot in all 88 Ohio counties for the May 4 primary election. These parties previously appeared on the 2008 general election ballot in Ohio, but have not appeared on a primary election ballot until this election, according to a media release from the Clinton County Board of Elections. Jonathan Narcisse told the Des Moines Register's Kathie Obradovich yesterday that he won't run against Governor Chet Culver in the Democratic primary. He plans to register for the ballot as an independent candidate. Narcisse served a term on the Des Moines School board is the publisher of several African-American and Latino-oriented publications. He also appears regularly on some talk radio programs in Iowa. His political views are an unusual blend, as you can see from reading his manifesto, An Iowa Worth Fighting For. Libertarian Ben Neece has taken the reigns of the Cameron County Libertarian Party . . . [he] said that when recently promoting the Libertarian Party, some Democrats and Republicans said that they are “fed up” with the ruling parties. “The general consensus was that Democratic and Republican officials are not doing what their philosophies dictate and the other thing that was very evident is that there is even worse animosity toward Washington,” he said. IndependentVoting.org attorney Harry Kresky's piece today on HuffPo Words Matter: Voters to Get Fair Wording of California Open Primary Initiative is a gem. Read it, and re-read it, and then read it to your friends! The assertion of such a right by the parties raises a fundamental question about the nature of our democracy. Does it rest on the rights of voters or on the rights of parties? On one level the answer is simple. The Constitution makes no mention of political parties. The Bill of Rights speaks of the "rights of the people," not of the parties. After all, it is the people who organize the parties, so how could the rights of the parties they organize trump theirs? We face a challenge every day in this country -- move forward, or stay here? And "stay here" increasingly means going backwards. In the very early days of our American revolution, soon after the independent forces won, George Washington warned us about the "baneful effects of party". In that spirit, let's continue the struggle. Robert M. Owens of Delaware, a Constitution Party candidate for attorney general, says the Franklin County Board of Elections improperly threw out valid signatures for not being legible, leaving him 19 short of qualifying for the ballot. Owens is asking the court to issue an order to place his name on the ballot or to direct the Franklin County elections board and possibly other county boards to recheck the petition signatures he filed. The party’s county chairman, Curtis Shipman, filed Tuesday as the second challenge to Republican Rep. Stan Cox’s two-term hold on the District 118 state House seat. Former Democrat Jerry Beck, of La Monte, has entered the race for the U.S. Senate seat being vacated by Republican Kit Bond. Beck will face a primary in August against Joe Martellaro, of Cuba, Mo. Bennie Hatfield, of Sedalia, filed to be the Constitution Party candidate for the open state Senate District 28 seat now held by Delbert Scott who is leaving office due to term limits. The party also is fielding Greg Cowan, of Lebanon, in the crowded race to challenge Rep. Ike Skelton, a Democrat, for the 4th Congressional District seat. The Committee to Elect Mike Simmons 2010 is proud to announce the kick off of the Patrick Henry money bomb. The goal for this fundraiser is to raise $5000.00 by March 23rd, 2010. The 23rd of March is the 235th Anniversary of Patrick Henry's "Give me Liberty or Give me Death" speech. A money bomb is a blitzkrieg style fundraiser that is typically center upon a special event not unlike a telethon. As you may or may not know Mike is facing some fierce opposition and his opponents have millions of dollars at their disposal. Your contribution will help fund the campaign and create literature to hand out in the upcoming election season. If you were a gambler would you feel safe with a 39% chance of winning? Probably not. According to data collected from the Freedom Index, since 2003 Congress has voted constitutionally only 39% of the time. The House's average is: 37% while the Senate's average is: 41%. How can someone swear an oath to uphold the Constitution and only vote constitutionally 39% of the time? The two party system clearly has no intention of upholding the Constitution; therefore it is time for a party rooted in the Constitution to take over. It is time for the Constitution Party! Running for mayor as an independent candidate starts pretty easy. It’s a five-minute session at the city clerk’s office. This brief background piece covers some of the nuts and bolts of that process, based on Steve Bean’s Tuesday afternoon appearance on the second floor of city hall at the city clerk’s office. As a bonus, there’s a bit of city history thrown in. Randall Hinton, who makes the compelling campaign argument, "We must stop consuming our children's future!" is one of a growing number of excellent candidates who are stepping forward to run for office all across the nation on the Constitution Party ticket in 2010. To watch Randall Hinton announce his campaign, as covered by the local media, please go to www.randallhinton.com/media/. For complete Hinton campaign coverage you are encouraged to visit the homepage of his excellent campaign website at: www.randallhinton.com. In a recent post at Poli-Tea on duopolist bias and third party media strategy, I suggested pressuring polling organizations to explicitly include third party and independent candidates in their public opinion surveys for specific elections. As a follow-up to this, I have drafted a short letter, which I just emailed to Rasmussen, urging them to do precisely that. The reason why I chose to begin with Rasmussen should be clear from the letter itself. Obviously, one email does not carry very much weight, which is why I am also asking you to join me in this effort. Please feel free to copy and paste or even re-work the following, and send it on to Rasmussen Reports at info@rasmussenreports.com, or even call them at 732-776-9777. I am writing to urge you to include third party and independent candidates for office in your regular surveys of public opinion for the 2010 elections. In a number of recent polls, you have included a third party "Tea Party" for consideration on the "generic ballot", revealing significant support within the US electorate for this third party or independent option. Currently, however, the "Tea Party" is registered as an actual third party in only two states; yet there are ballot qualified third party and independent candidates for office at all levels of government in almost all 50 states. With few exceptions (ex. Chafee in RI and Cahill in MA), Rasmussen typically gauges support for these candidates by asking respondents if they support Republican X, Democrat Y or "some other candidate," as for instance in your recent survey covering the gubernatorial race in Illinois. This, however, fails to assess support for any specific alternative to the major party candidates. One wonders what level of support Democrats and Republicans would garner in a given race if you asked respondents to choose between Independent X, Libertarian Y, Green Z or "some other candidate." Rasmussen Reports often quotes Scott Rasmussen himself saying that Americans are "united in the belief that our political system is broken, that politicians are corrupt, and that neither major political party has the answers." I agree with this assessment and therefore urge you to begin actively gauging support for specific, ballot qualified, third party and independent candidates for office in your polling nationwide. Obviously, suggestions and criticism are welcome in comments. [Green Party county co-chair] Jayne King has banded together with some strange bedfellows: She says that the Electoral Reform event she's helping to organize for this Saturday has support from a whole spectrum of political activists. Sure, members of the Green Party and the ACLU will show up -- you expected that, right? But so, King says, will Tea Party activists, Libertarians, Independents, and even a few Republicans. The common thread is that all agree that major reforms are due in our highly compromised elections system. People are disenfranchised. Third- and fourth-party candidates are discouraged from running. The public is apathetic about voting. Lobbyists exert undue influence. And our state Legislature is stocked with millionaires who don't represent the will of the common people. King says that Saturday's event, which will take place from 3:30 to 6 p.m. at the Unitarian Universalist Fellowship in Boca Raton, will host speakers on the subject of electoral disenfranchisement, followed by break-out groups, to come up with a "white paper" organizers will distribute to our elected officials. Many Greens are planning to march against US wars in Washington DC on 3/20/10, but not all may be aware that a march for immigration reform is planned for the very next day in DC. Participants in Sunday’s March for America will be marching for “Immigration reform for new American families and economic justice for all American families”. MD: Libertarians Pledge "Six to Zero in Eight"
On Saturday, March 13, 2010 the Maryland Libertarian Party held its annual state convention. The Libertarian Party’s Candidate for Governor, Susan Gaztañaga, began to outline some key issues and the platform of her campaign. Two issues that she has brought are the Sales Tax and the Wars in Iraq and Afghanistan. “Six to Zero in Eight”, Gaztañaga pledges: “We need to eliminate our State Sales Tax and boost the economy of Maryland.” The plan would reduce the sales tax rate to zero in eight years. The Maryland Libertarian Party strongly opposes the draconian tax policy of Governor Martin O’Malley, who raised the Sales Tax in an economic downturn. Businesses on the Eastern Shore of Maryland would directly benefit from this proposal by the Gaztañaga Campaign, as they would be on equal footing with Delaware businesses, which currently do not have a sales tax. Recently, the Fort Walton Beach Tea Party held a candidate forum for the Florida 4th District representative election. This was the seat formerly held by Ray Sansom. The five Republican candidates stood next to each other and answered individually crafted questions created by a Tea Party committee. The one Democrat contender for state representative was invited, but did not appear . . . But Okaloosa County does not need just another forum. It needs competition. It needs a new approach. At the end of the evening it was clear that the Tea Party forum was political routine. Government control over individuals and business will still be the only means of doing business. The Green Party of California (GPCA) announced this week it was officially supporting only one of five propositions on the June 2010 ballot - a measure that would experiment with public financing of some candidates in the 2014 and 2018 elections to avoid the corrupting influence of lobbyists. Voting at the party’s state convention in San Jose last weekend, delegates representing Green Party counties throughout the state agreed to support Prop. 15, which would use fees paid by lobbyists to finance Secretary of State candidates. It means smaller parties could receive up to $1.3 million in public financing for that SOS race. PROP. 14: No Support. The GPCA heavily criticized Prop. 14, the so-called “top two” measure, which would, if passed, only allow the top two winners in the primary to be on the ballot in the November general election. The result, said the Greens, would result in fewer voter choices at time when voters are dissatisfied with current choices; increased candidate spending; muzzled smaller parties and their messages; and increased influence by the same moneyed special interests bankrolling Prop. 14. The Libertarian Party of California also opposes the measure, and asks visitors of its website to "Join the Libertarian Party of California in preserving voter choice by opposing Proposition 14 on the June Primary ballot." The page also links to Stop Top Two, which Ross profiled here at TPID the day the site launched. Prop. 14 increases the ballot access requirements for parties to remain ballot-qualified. By eliminating the easiest way that parties remain ballot-qualified (the 2% vote test for any statewide office in a midterm year), the measure kills the Peace & Freedom Party, and will force the Libertarian Party to engage in an expensive registration drive. If Prop. 14 passes, the only way parties can remain on the ballot is to have registration of 1% of the last gubernatorial vote. That will probably be 100,000 after 2010. PFP only has 58,000 and Libertarian has 84,000. It costs about $5 per registration to pay people to get new registrants. And, Prop. 14 says write-ins can't ever be counted in November for Congress and state office. And, Prop. 14 makes it very unlikely that any minor party candidates will appear on the November ballot. We know this from the experience of Louisiana and Washington state. No minor party person ever qualified for a second round in Louisiana in the 35 years the system has been used there. In Washington state, in 2008, using "top-two" for the first time, there were no minor party or independent candidates on the November ballot for any congressional race or statewide state race for the first time since Washington became a state in 1889. For more, see also Richard's guest posts on the measure at the Election Law Blog and at Nancy's The Hankster. California Court of Appeals says no to Proposition 14 opponents, which is good news for independent voters. Open primaries gaining support in Pennsylvania and Illinois. Rock on! Editorial: Bay Area News Group urges voters to reject Proposition 15 (MediaNews editorial, Tri Valley Herald) Prop. 15 conflicts with a far more promising campaign reform measure, Prop. 14, which eliminates closed primaries. Prop. 14 would establish an open primary, with the top two vote-getters going on to the general election. The Prop. 15 grant formulas would fall apart if, as we hope, Prop. 14 passes. PA: Are we getting the best candidates? (By: Ernie Rosato, Landsdale Reporter - PA) As a libertarian/constitutionalist at heart, and with utter disdain for the socialist progressive values that the Democratic Party has endorsed, I have been forced to side with the Republican Party for more than 30 years because this commonwealth does not recognize the independent voter. Since 1962, the percentage of eligible voters picking Democratic and Republican nominees for governor and U.S. Senate has been declining to less than 10% per party. The percentages are even lower for U.S. House and state legislature primaries, Gans says. As noted in an excerpt from the Michigan Messenger yesterday: "we spend millions and millions of taxpayer dollars to have the state run the nomination votes for the two major parties." And then no one even votes in them! it is the PRESENT members of our elected bodies that have created the havoc we now find ourselves in and it is they who, due to their constant bickering and game playing, have not been able to straighten out the very messes they have created. It is not enough to remove some and leave others… we can only send a strong message by removing them all. It doesn’t matter if you wish to vote Republican or Democrat or Independent… just make sure the present official is replaced. You cannot change things by leaving them as they are and not voting leaves things exactly as they are. Not voting as a protest is a guarantee that the very thing you are protesting will remain the way it is. I am seeking the Green Party's nomination for U.S. Representative from Denver (District 1). The Green Party's state nominating convention will be held in early June at a time and location that has not been set yet. If there is a primary election, it will be held on the second Tuesday in August. Sebastian “Skip” Mender, of Honesdale, is the president of the Wayne County Green Party. Some wag once observed, "The great thing about America is practically anyone can become President - and the problem with America is practically anyone can become President." I'm not an elitist - I do not agree with those who think that all Presidents must come from aristocracy, or that the working classes are incapable of producing great leaders. I do not even agree with the assertion that all beauty pageant contestants are ipso facto airheads. No, I judge Sarah Palin unqualified to be President strictly based on her own unique personal merits. We have contradictory expectations of our Presidents . . .
She has not shown the least bit of interest in crafting compromise or consensus, or for that matter original thoughts, when divisive soundbites are ever so much more effective. She may excite her followers, and drive her opponents nuts – but such talent is insufficient for success with the daily realities of governing. Those who think that Palin's election would herald some kind of conservative watershed moment would do well to reflect that progressives thought the very same thing about Obama not so long ago. Our problems are systemic – and merely changing the party in power is not going to solve them. Gene Waldorf, a former DFL state Senator from St. Paul, told the St. Cloud Times that he'll run for Congress as an independent and challenge DFL U.S. Rep. Collin Peterson. In an effort to increase pressure on Democrats to vote for the health care bill, Andy Stern, president of the Service Employees International Union, warned on Monday that his powerful union would back some independent candidates this fall against House Democrats who vote against the bill. I am seeking the chairmanship of the Libertarian National Committee. We need to dramatically change the direction of the Libertarian Party. We do not need an “administrator” who shuffles papers. We need a dynamic voice for Libertarian principles. We need to bring more people to the Party so that we can dramatically and quickly reduce the size and scope of the State. See our entire list of candidates sorted by state. Please note that in some cases, state parties choose to list all filed candidates prior to the final nomination (for example, Texas lists five candidates seeking the LP nomination for Governor), while other states wait until after nomination to list their candidates. If you don't see any candidates in the districts where you live, then please visit this page to see how Libertarian candidates make a difference, and consider signing up to be a possible candidate. Deadlines vary by state, but the sooner you express your interest, the better. If you've already expressed interest and gotten no response, you might try again. The economic crisis may have sounded a death knell for investment banks, construction companies and countless small businesses, but there are some groups that are benefittng from the general malaise. Alternative political movements such as communism and socialism are hoping that some Americans will go outside the mainstream and adopt a socialist ideology, breathing new life into these organizations. . . .
Officials from the Communist Party USA and the Socialist Party USA say they have never seen such interest from Americans as they see today. A poll conducted by Rasmussen in 2009 showed that 20 percent of Americans favor socialism over capitalism, with more support among younger people. Of adults under 30, 37 percent of them said socialism was the better choice. Coffee or Tea? A Party's a Party, Isn't It? If the Tea Party is a conservative element seeking to pull the Repubs (more) to the right, what's your guess as to the role the Coffee Party wants to play? Is it MoveOn in disguise? Maybe.... Whatever it is, the notion of rallying people around an agenda of civil discourse makes me a little wary, not because I think screaming and yelling is a productive mode of social dialogue, but because it seems to me it's more like using a silver spoon where a backhoe would do just as well. Is it really ok to destroy the country with a smile on your face and a "so sorry" on your lips? And isn't this the basis of the independent movement in the first place? We need innovative solutions to very serious problems we're facing, and those solutions are not coming from the two major parties, no matter how polite or nasty they might be. You can't turn a corrupt partisan special-interest driven political culture into something it's not, no matter how carefully you chose your words. That's why 40% of the American people are independent. Politely or rowdily, we're leaving. Here's to an irreverent independent movement for all voices who want to help move the country forward. Coffee Party; grass roots movement brewing nationwide (KTNV Las Vegas) "Their agenda is to restore respect, accessibility and civility to the process. It's not demean or put fear," said Sandra Myer, a Coffee Party follower. Sacramentans plan political 'coffee party' (By Anna Tong, Sac Bee) Castro, a registered independent voter, said he will encourage people at today's gathering to discuss politics in a respectful manner. It remains to be seen whether they will be able to mobilize like the tea party has. "I would like to see us develop a platform based on issues and not on any agenda that would be categorized as left or right," Castro said. "I would also like to see us possibly support candidates." Cahill navigating uncharted waters-No independent has won statewide race (By Brian C. Mooney, Boston Globe) Cahill often invokes voter registration statistics to buttress his rationale for an independent candidacy. Democrats outnumber Republicans more than 3 to 1, but so-called unenrolled voters now constitute 51 percent of the electorate.